The feature documentary that was four years in the making will have its world premiere at the Glasgow Film Festival Wednesday 28th February. For centuries, individuals have embarked on the Camino (the Way), from Ireland to Santiago de Compostela in A Coruña, Northern Spain. 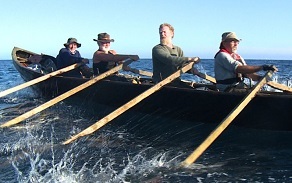 ‘The Camino Voyage’ tells the incredible story of four individuals who undertake the massive journey over the course of three years in their own handmade traditional boat, called a ‘Naomhóg’. The film documents the passengers’ courage and endurance, with storytelling, poetry and song that transcends cultures and religions. Director Dónal Ó Céilleachair's said, “When the Naomhóg left Ireland in 2014 on this historic 2,500km modern day Celtic Odyssey not everyone believed that such an epic voyage was possible but through sheer perseverance and an uplifting freedom of spirit – that is so emblematic of all that is inspiring in Irish culture – the crew overcame Herculean tasks and challenges to finally reach Santiago de Compostela 3 years later. “With over 200 hours of footage shot over the 3 years of the odyssey this film has been 4 years in the making and has come with its own obstacles and challenges; but the great lessons of the Camino can become the great lessons of life for those willing or able to listen and to hear. The tragic loss of Danny in 2017 only reminds us of the preciousness of this short time we have on this unique planet of ours and we would do well to take inspiration from his own inimitable independence of spirit. An Anú Pictures Production, the film was four years in the making, with 200 hours of footage over a 2.500km voyage from Ireland to Santiago de Compostela. It features Danny Sheehy, Brendan Begley, Liam Holden, Breandán Moriarty & Glen Hansard. Music by Brendan Begley, Peadar Ó Riada, Glen Hansard, Liam Ó Maonlaí, Carlos Nuñez and many many more. The documentary was funded by the Broadcasting Authority of Ireland with the Television Licence Fee with the participation of TG4, The Irish Film Board and RTÉ.